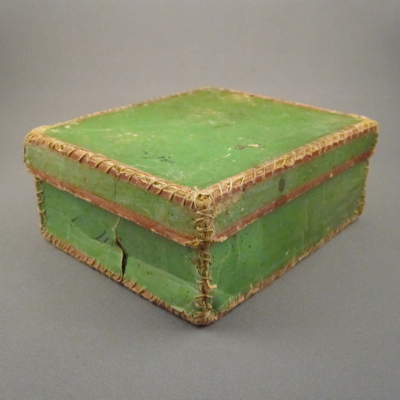 Veering away from my more typical posts showcasing inventive repairs on ceramics and glass, today I am featuring the art of a mended paper box. 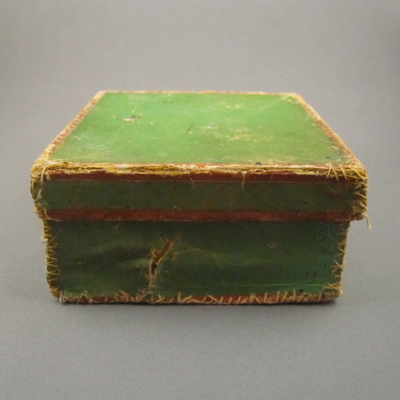 Before the invention of masking and Scotch tapes, damaged paper products were repaired using strips of thin fabric, patching with paper, and mending with thread. 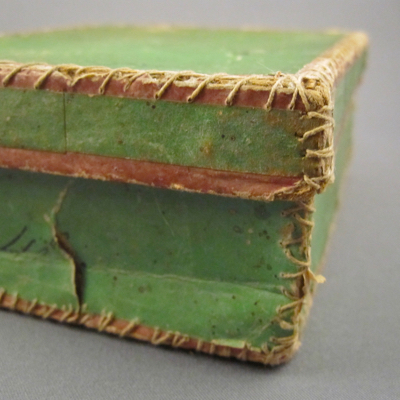 I have long admired the unintentional artistry created by patterns made by tiny stitches used to repair torn pages in a book. 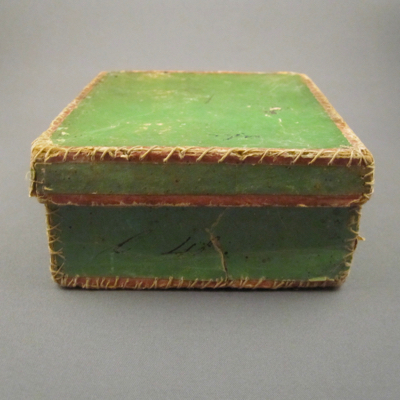 This small green paper box, most likely made in New England in the late 1800s, measures 4.75 inches by 4.25 inches and is 1.75 inches tall. 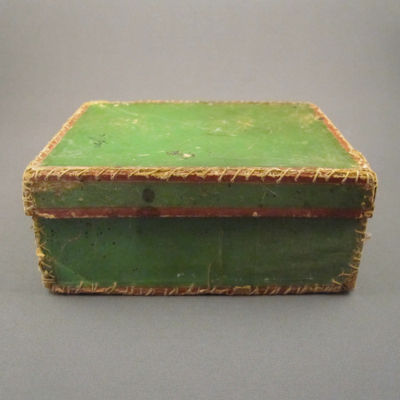 It seems the entire box fell apart and rather than tossing it into a roaring fire, someone quite cleverly stitched up every edge, giving it a unique folksy look. 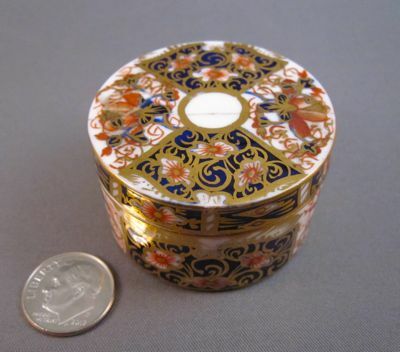 This tiny porcelain ointment box was made in England by Royal Crown Derby in the early 1900s. 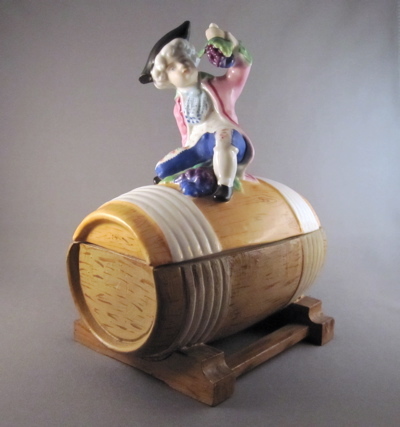 Standing a mere 1″ tall and with a diameter of 1-3/4″, it is one of the smallest antiques with inventive repairs I own. 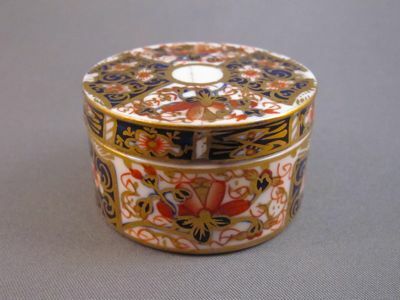 It is nicely hand decorated in the Imari pattern with classic cobalt blue, red and gilt enamels. 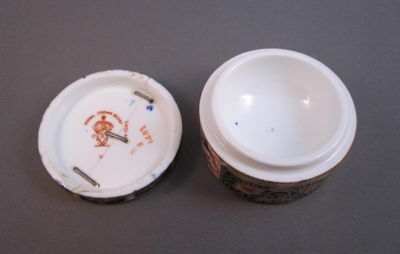 The “V” mark on the bottom of both the lid and base dates this wee box to 1905. 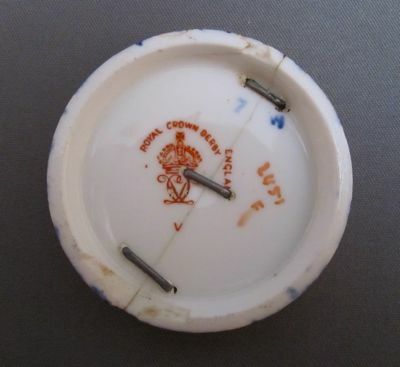 The underside of the lid reveals three metal staples, graduating in size from 1/4″ to 3/8″ long, which hold the two broken halves tightly together. I found this oddity in a gift shop in Provencetown, MA and thought it was so ugly I almost didn’t buy it. 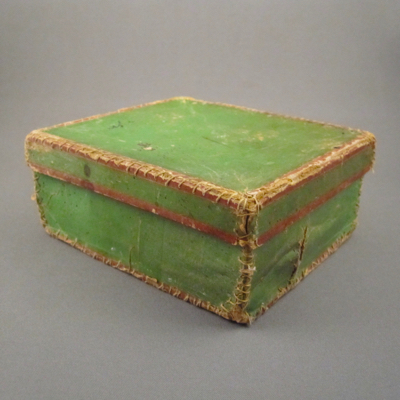 But the “beauty” of this repair is that the entire lower portion of the covered box that was lost, has been lovingly recreated out of wood. 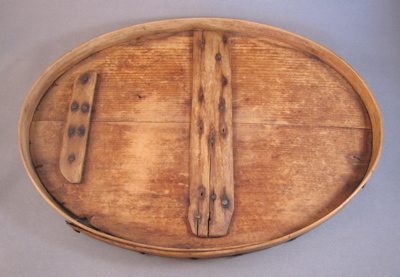 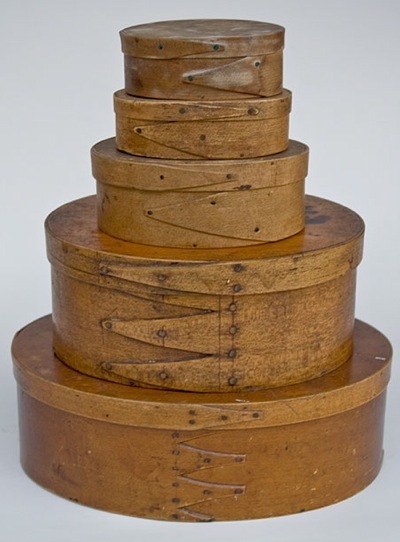 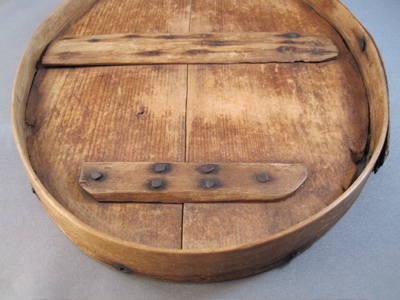 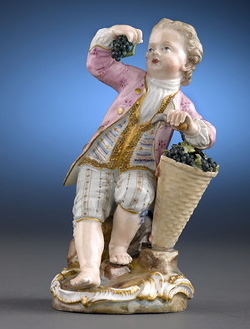 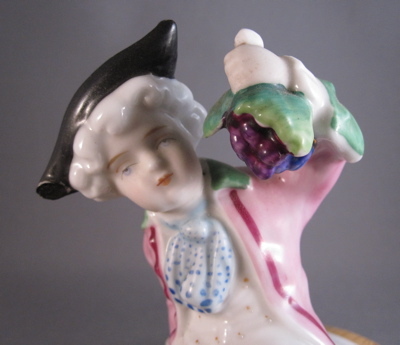 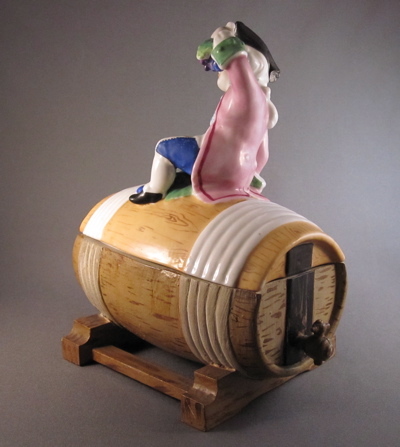 The back view of the wine barrel-shaped box, which measures 7-3/4″ high and 6-1/2″ long, shows great skill and detail. 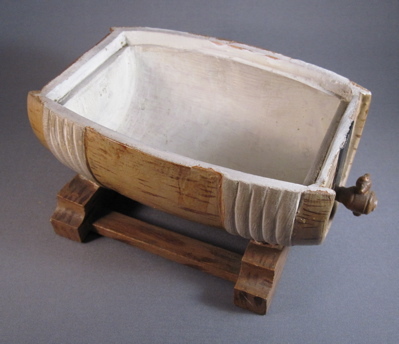 Matching the faux woodgrain on the porcelain top, a craftsman painted the replaced wooden bottom to look like porcelain, which had already been painted to look like wood! 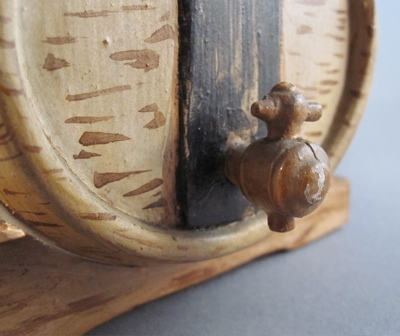 Wonderful details include this minutely carved spigot.